I'm excited to announce that Lumpy and Wheezy will be taking their story on tour! 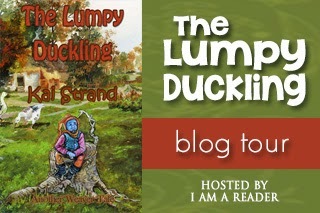 Starting tomorrow, December 10th, THE LUMPY DUCKLING and I will be touring the blog-o-sphere with book spotlights, reviews and interviews. And though there will be fun galore, my tour host, I Am A Reader, and I are offering a giveaway of a $25 Amazon gift card or PayPal cash as extra incentive to join the fun. You'll find the tour schedule here. Please make your way through the stops and thank the hosts for their generous time and attention on THE LUMPY DUCKLING. Join us December 10th through the 18th. See you around the blog-o-sphere!